The Best Tool for Learning About the Diversity of Cuisine from Around the World Increasing world travel, changing demographics, multinational business, and greater diversity at home have whetted our appetites for international flavors-whether in national dishes or creative culinary fusions. Anyone entering the foodservice industry today must be prepared to meet this growing demand. Taste truly has gone global. 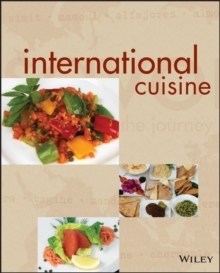 With its comprehensive approach, International Cuisine explores countries and regions, cultures, and ingredients, and describes the crucial role they play in different world cuisines. This comprehensiveand engaging resource gives readers an introductory knowledge of food cultures from five continents, as well as the Caribbean and British Isles. International Cuisine features: A total of 415 authentic recipes, representing all countries and regions discussed Recipes formulated for current practices and available ingredients, including step-by-step instructions Beautiful color photographs illustrating finished dishes An emphasis on sustainability and how locally grown foods enhance cuisines Coverage of history, geography, and people alongside recipes and cooking techniques Detailed ingredients lists and culinary glossaries for each country or region discussed Clearly presented and enjoyable to read, International Cuisine provides students, teachers, and professionals in foodservice a window to a wide variety of the world's cuisines. The Art Institutes (artinstitutes.edu), with more than forty educational institutions located throughout North America, have provided an important source of culinary arts, design, media art, and fashion programs for professionals for more than forty years. 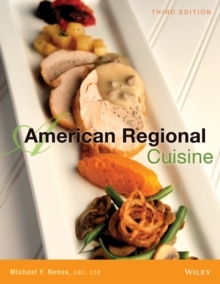 Since 1991, The International Culinary Schools at The Art Institutes , with their more than thirty locations, have offered exciting programs in culinary arts featuring a professional kitchen environmentand, in some locations, fully operational restaurants. Students work alongside instructors to learn and perform the hands-on skills chefs use each day. Based on classical Escoffier, Asian, and Latin culinary techniques, with an emphasis on progressive trends and practices, the curriculum is designed to develop and sharpen fundamental cooking techniques and professional skills and introduce a variety of international cuisines.